Wapakoneta’s Jessica Davis drives against Kenton’s Layne Taylor during a Saturday night Division II sectional final at Leipsic High School. LEIPSIC — Say it and believe it. For the first time since 1998 Kenton is heading to the girls district tournament. Kenton’s defense was steady all night and helped the Wildcats post a 48-33 victory over Wapakoneta to win the Division II girls basketball sectional championship Saturday at Leipsic. Kenton (17-6) advances to the district semifinals against Napoleon (15-8) at 6:15 p.m. Thursday at Paulding High School. Wapakoneta ends its season 13-10. Kenton won the Western Buckeye League showdown between the two teams. Offensively, Taylor had 21 points and nine rebounds. Kenton point guard Ellie Miller had 12 points. Kenton played without its center Caitlin Tudor, who is out with a concussion. 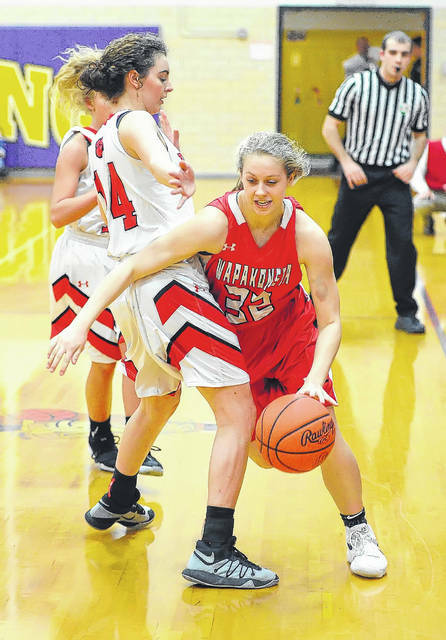 Wapakoneta point guard Lexi Jacobs got into early foul trouble and was held to three points. Makenzie Wilson led the Redskins with 11 points and 10 rebounds. Sarah Pothast had four points and six rebounds. Kenton mixed up its defenses throughout the game. It used a 2-2-1 press, along with a 2-3 zone and man-to-man. No matter the defense, the plan was to make sure Wapakoneta was having difficulty driving to the basket and dumping it into the post. Kenton also forced 20 Wapakoneta turnovers, including 13 in the first half. Kenton also performed well at the foul line, hitting 15 of 18 in the first half. Taylor was 10 of 14 at the line. That’s after she was shooting 13 percent from the line over the first four games. Wapakoneta went out to an early 7-4 lead. Kenton then ripped off a 9-0 run to pull out to a 13-7 lead. Kenton led 16-9 after the first quarter when Kori Barrett sank a 25-foot, 3-pointer just before the first-quarter buzzer. Kenton led 36-23 at the half and pulled away from there in the second half. Wapak won the boards, 33-27. This entry was tagged kenton, Wapakoneta. Bookmark the permalink.